Metal Garages Direct offers metal garages to most of the state of New York NY. 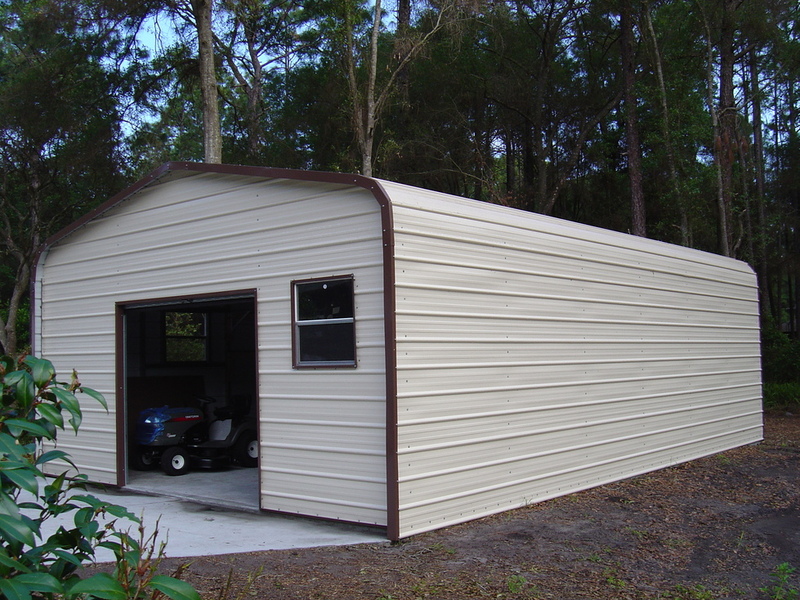 We offer our New York metal garages in many different sizes starting at 12' wide up to 60' wide and as long as you want. Our garages are available in up to 16' side height. Our New York NY metal garages are available in 13 different colors! In addition New York NY metal garages are available in both 14 ga(no warranty) or 12 ga(20 year rust through limited warranty) and come standard with 29 gauge paneling, but are also available in 26 gauge(most states). New York steel garages are available in both certified and non certified. We also offer carports, metal barns and steel buildings!Our metal garages are great for storing cars, trucks or tractors. A New York steel garage helps protect your assets from mother natures unpredictable weather. ​Unlike most companies we display our prices for you to see so check out our garage packages below! Our New York metal garages are delivered and installed for free as long as your ground is level. Our normal delivery time for New York are is 2-4 Weeks and up to 8 weeks. So if you are looking for a great metal garage or steel garage at a great price with quality service then give us a call toll free at 1-877-662-9060 or email us: sales@mayberrymetalstructures.com. ​Addison NY, Akron NY, Albany NY, Albion NY, Alden NY, Alfred NY, Allegany NY, Altamont NY, Amenia NY, Aherst NY, Amsterdam NY, Anover NY, Angola NY, Arcade NY, Armor NY, Athens NY, Attica NY, Auburn NY, Averill Park NY, Avon NY, Bainbridge NY, Baldwinsville NY, Ballston Spa NY, Batavia NY, Bath NY, Beacon NY, Big Flats NY, Binghamton NY, Blasdell NY, Boonville NY, Berwerton NY, Brockport NY, Brocton NY, Buffalo NY, Burnt Hills NY, Cairo NY, Caledonia NY, Cambridge NY, Camden NY, Canajoharie NY, Canandaigua NY, Canastota NY, Canisteo NY, Carmel NY, Catskill NY, Cayuga Heights NY, Cazenovia NY, Central Square NY, Chadwicks NY, Chatham NY, Chenango Bridge NY, Chili Center NY, Chittenango NY, Churchville NY, Clarence NY, Clarence Center NY, Clifton Springs NY, Clinton NY, Clyde NY, Cobleskill NY, Cohoes NY, Colonie NY, Conklin NY, Cooperstown NY, Corinth NY, Corning NY, Cortland NY, Coxsackie NY, Cuba NY, Dansville NY, Delhi NY, Delmar NY, Depew NY, Deposit NY, De Witt NY, Dolgeville NY, Dryden NY, Dundee NY, Dunkirk NY, East Aurora NY, East Glenville NY, East Greenbush NY, East Rochester NY, Eden NY, Elma NY, Elmira NY, Elmira Heights NY, Elsmere NY, Endicott NY, Endwell NY, Fairmount NY, Fairport NY, Falconer NY, Fayetteville NY, Fort Edward NY, Fort Plain NY, Frankfort NY, Franklinville NY, Fredonia NY, Frewsburg NY, Fulton NY, Gang Mills NY, Gates NY, Geneseo NY, Geneva NY, Getzville NY, Gewanda NY, Glasco NY, Glens Falls NY, Gloversville NY, Greece NY, Greene NY, Green Island NY, Greenwich NY, Groton NY, Hamburg NY, Hamilton NY, Harris Hill NY, Herkimer NY, Hilton NY, Holley NY, Homer NY, Honeoye Falls NY, Hoosick Falls NY, Hornell NY, Horseheads NY, Houghton NY, Hudson NY, Hudson Falls NY, Hurley NY, Hyde Park NY, Ilion NY, Irondequoit NY, Ithaca NY, Jamestown NY, Jefferson Valley NY, Johnson City NY, Johnstown NY, Kenmore NY, Kerhonkson NY, Kingston NY, Lackawanna NY, Lake Carmel NY, Lake Delta NY, Lancaster NY, Lansing NY, Le Roy NY,Lewiston NY, Liberty NY, Lima NY, Little Falls NY, Little Valley NY, Lockport NY, Lyndon NY, Lyons NY, Macedon NY, Mahopac NY, Manlius NY, Marathon NY, Marcellus NY,​ Maryville NY, Mattydale NY, Mayville NY, Maywood NY, Mechanicsville NY, Medina NY, Menards NY, Middleport NY, Middletown NY, Millbrook NY, Minoa NY, Mohawk NY, Monroe NY, Monticello NY, Montour Falls NY, Moravia NY, Morrisville NY, Mount Morris NY, Mount Vernon NY, Naples NY, Nedrow NY, Newark NY, Newburgh NY, New Fane NY, New Hartford NY, New Paltz NY, New Windsor NY, New York NY, New York Mills NY, Niagra Falls NY, Niskayuna NY, Niverville NY, North Bloomfield NY, North Boston NY, North Chili NY, North Syracuse NY, North Tonawanda NY, Norwich NY, Oakfield NY, Olean NY, Oneida NY, Oneonta NY, Orchard Park NY, Oswego NY, Owego NY, Oxford NY, Painted Post NY, Palmyra NY, Pawling NY, Peekskill NY, Pennfield NY, Penn Yan NY, Perry NY, Phelps NY, Phoenix NY, Port Dickinson NY, Port Ewen NY, Poughkeepsie NY, Ravenna NY, Red Hook NY, Rensselaer NY, Rhinebeck NY, Richfield Springs NY, Rochester NY, Rome NY, Rotterdam NY, Saint Johnsville NY NY, Salamanca NY, Sandy Beach NY, Saranac Lake NY, Saratoga Springs NY, Saugerties NY, Schenectady NY, Scotia NY, Scottsville NY, Seneca Falls NY, Sherrill NY, Sidney NY, Silver Creek NY, Skaneateles NY, Sodus NY, Solvay NY, South Glens Falls NY, South Lockport NY, Southport NY, Spencerport NY, Springville NY, Stamford NY, Stillwater NY, Syracuse NY, Ticonderoga NY, Tilson NY, Tivoli NY, Tonawanda NY, Town Line NY, Troy NY, Trumansburg NY, Union Center NY, Utica NY, Valatie NY, Vestal NY, Victor NY, Voorheesville NY, Walden NY, Walton NY, Wanakah NY, Warsaw NY, Waterloo NY, Waterville NY, Watervliet NY, Watkins Glen NY, Waverly NY, Wayland NY, Webster NY, Weedsport NY, Wellsville NY, West Corners NY, West Elmira NY, Westfield NY, West Glens Falls NY, West Hurley NY, Westmere NY, Westons Mills NY, West Seneca NY, Westvale NY, West Webster NY, Williamson NY, Wolcott NY, Woodstock NY, Yorkville NY and Youngstown NY!